Edmonton winters can be harsh. Is your business faced with slippery surfaces that can cause a slip or fall? At EverLine Coatings we can eliminate the chances of a fall with the application of a non-slip specialty coating. At EverLine Coatings and Services, we know Edmonton businesses are faced with snow, ice, rain and moisture making their walkways and surfaces slippery. This is potentially hazardous as people may slip and fall creating liability issues for the business. At EverLine, we have the ultimate solution to eliminate the possibility of someone slipping and falling on your property. We are able to provide a non-slip specialty coating that can be applied to slippery surfaces to ensure no one slips or falls in slippery conditions. Our non-slip specialty coatings have a variety of potential indoor and outdoor applications. Whether it is a walkway, bike path or roadway we can apply a non-slip specialty coating. When you choose EverLine Coatings and Services, you get the EverLine advantage. We only use the highest quality non slip coating products with a highly trained installation crew to go along with it. This ensures a perfect installation and great fit and finish for our products and services everytime. Everyone walking around your business or property will be safe and it will look great too! To ensure that the application of a specialty non-slip coating is executed properly and effectively, you need highly trained, experienced individuals and top notch equipment to go along with them. At EverLine, we have application crews that have been trained to deliver a great result every time with the best products available. Our crews use the best equipment available on the market to ensure the job is done efficiently, on time, within budget and to ensure the durability of the coating. We always send the best staff available to apply a non-slip coating to your property. 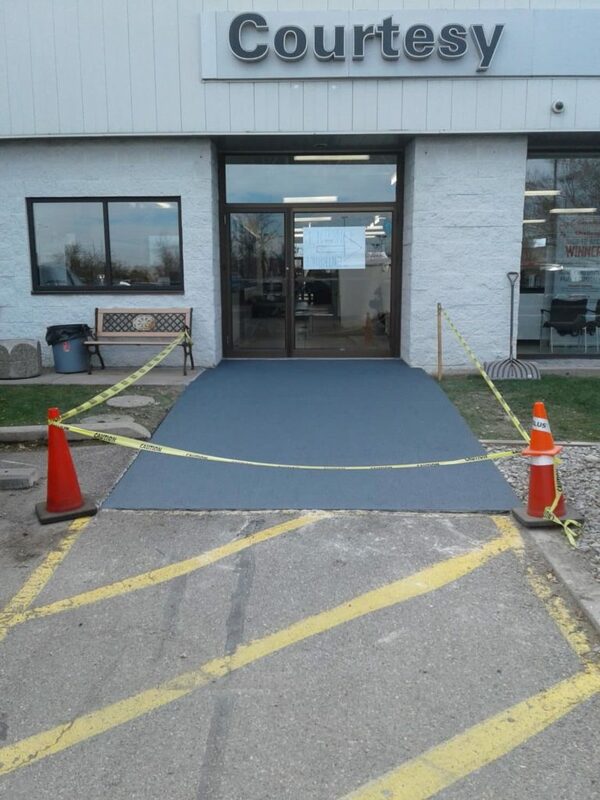 If you are receiving non-slip coating services from EverLine Coatings and services in the near future, we ask you to take a few steps in preparation before our crew arrives. Firstly, please ensure that the surface we will be applying a non-slip coating to is clean and free of any debris. If you require assistance in cleaning the surface, please enquire about our power washing and sweeping services as well. Secondly, please inform the users of the property that we will be applying a non-slip coating and put up signs as a warning as well. If anyone walks through the wet coating it will ruin any work we have completed.